On the other side of the island, you’ll find the coveted area of the Caribbean Riviera, home to Ocho Rios and as known melting pot of all the Jamaican magic. Here you can hike your way to Dunn’s River Falls, stand in awe in front of the St. Ann Mountains, and dance the night away to authentic reggae music where it was born. In the middle of all the action lies Beaches Ocho Rios and its 3 distinct villages. No matter the size of your family, you’ll find accommodation styles and gourmet dining options to fit everyone’s tastes. The resort even offers its very own golf and country club with a golf clinic just for kids. Whether you’re rambling through the waterpark, splashing in the Caribbean waters, or keeping calm and focused on the golf greens, Beaches Ocho Rios is sure to cater to every family. 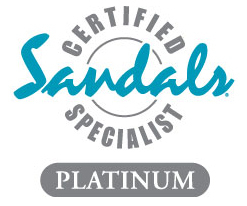 Click on Beaches logo to book your family vacation to Beaches all inclusive resorts and get our Beaches Certified Specialist expert advice!